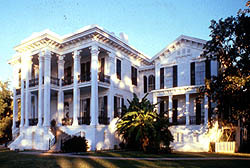 The Nottoway Plantation House, one of the largest antebellum plantation houses in the south, is composed of 64 rooms, 7 staircases, and 5 galleries. This 53,000-square foot plantation home, constructed by John Hampden Randolph in 1858, is a fine example of an antebellum home. Randolph, whose father had come from Virginia in 1820, purchased the area in 1841. In 1860 Nottoway Plantation encompassed 6,200 acres and Randolph, the builder and owner of the property during that time, owned 155 African-Americans that worked his sugarcane plantation as slaves. When Randolph was ready to build his house, he went to New Orleans and asked various architects to submit designs, and chose Henry Howard's. Nottoway survived the Civil War, however damage occurred when a Union gunboat on the Mississippi River attempted to destroy the magnificent house until the gunboat officer realized he had once been a guest there and decided to spare Nottoway The Randolphs held onto the house through the Civil War and Reconstruction until 1889, when Mrs. Randolph sold the mansion following her husband's death. Nottoway sits about 200 feet behind the Mississippi River Levee surrounded by oaks, magnolias, pecan trees, and sweet olives. Nottoway House is distinctive for being an essentially Italianate Style plantation house built in an era dominated by Greek Revival architecture. Nottoway contains an elegant, half-round portico as the side gallery follows the curve of the large ballroom bay window. Nottoway's thin Italianate pillars stretch vertically to touch all of its three levels, extending from the house's one-story brick base to the paramount height of the third-story made of wooden frame. From the front gallery the Mississippi River is in view. 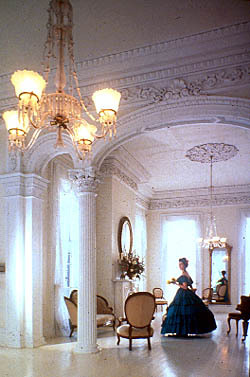 The interior of Nottoway is white in color, including Corinthian columns, lace curtains, carved marble mantels and even the floor, creating an elegant environment. Nottoway Plantation House is located at 30970 Hwy. 405, the Mississippi River Road, 2 mi. north of White Castle, and can be accessed from Hwy. 1. Fortunately, the house was not damaged by Hurricane Katrina, but please check with them directly to confirm the current hours of operation. Tours are offered daily 9:00am to 5:00pm; there is a fee. The restaurant at the plantation is open 11:00am to 3:00pm, and 5:00pm-9:00pm daily. Please call 225-545-2730 for further information.